The US employment and wages data gave some support to USD against EUR. The US ISM Non-Manufacturing PMI will be the most influential economic report for EURUSD. The support rests at 1.13720 with resistance at 1.14080 which the weekly pivot point at 1.13820 is located in between the lines. The EMA of 10 is moving with bearish bias in the ascendant channel and it is below the EMA of 200 and the EMA of 100. The RSI is moving on the 50 level, the Stochastic is moving in low ranges and the MACD line is above the signal line in the positive territory. The ADX is showing buy signal. 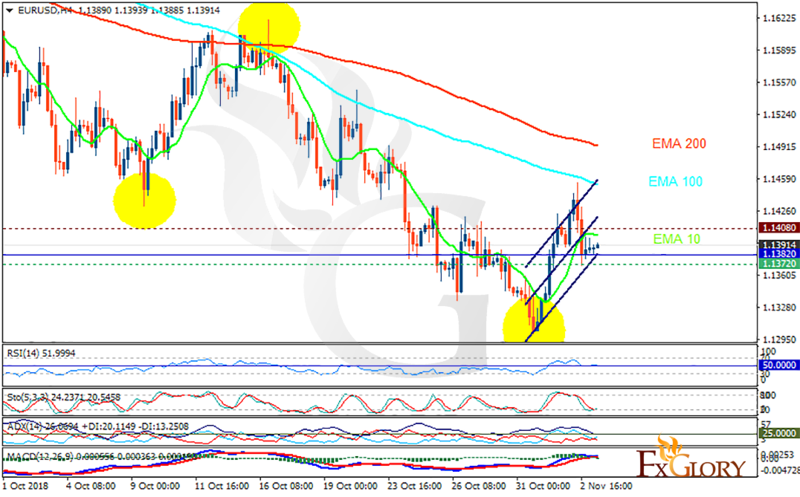 The resistance level breakout can push the price up towards 1.145, otherwise, EURUSD falls towards 1.134.